This work was taken up by contain-III Block which conveys a good instance of convergence of MGNREGA fund with other development funds. Not only that, it was appreciating effort to keep the environment clean and healthy. Benefit/Output of the Project: Children uses the place as play ground as well as aged persons can spend their leisure time there. Benefit/Output of the Project: In this remote area, there is no good playground in the village for the little children. To meetup such crisis, a charming scheme named ‘AMAR GRAM AMAR BAGAN’ has been taken up to execute it under MGNREGS for the rural children. 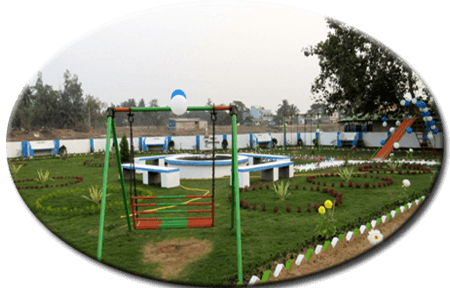 On 30.07.2015 it has been completed and open to all specially for the children in the rural area for enjoyment. The advance aged persons also visit this ground for morning and evening walk purposes and also for spearing time and it is an important asset of the Gram Panchayat. 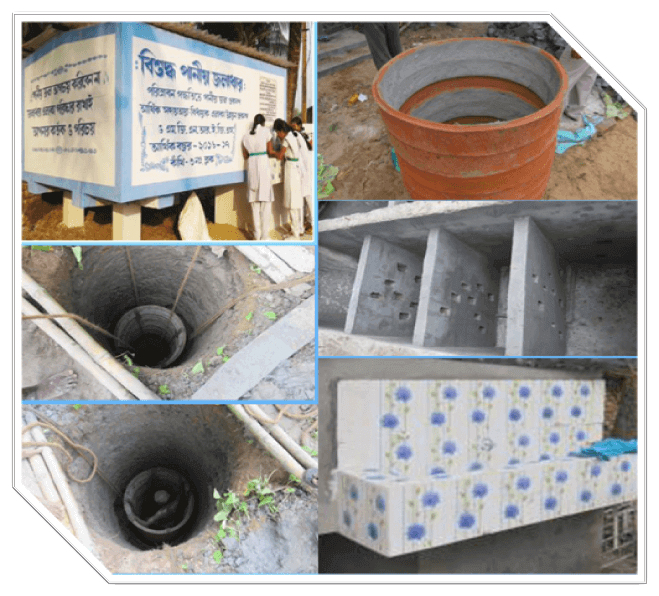 This project to supply safe drinking water without interrupting the underground water. This project will generate one mandays perday throughout the year. 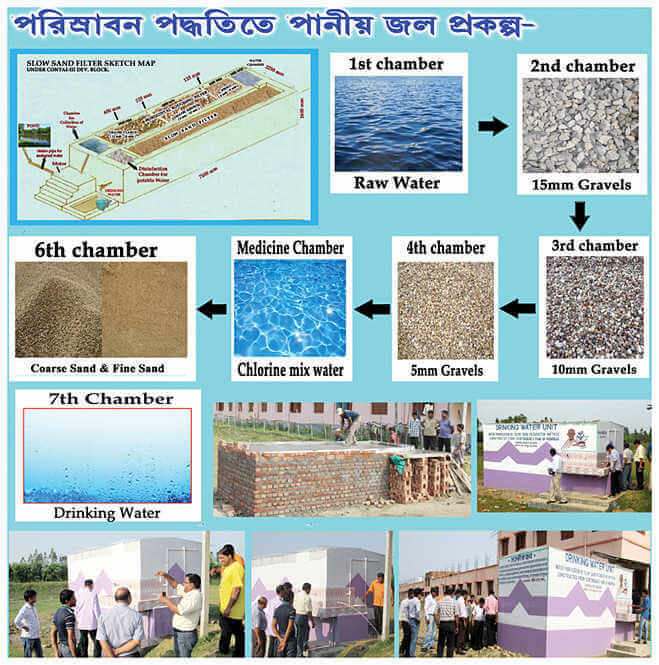 Benefit/Output of the Project: To met up dirnkable water scarcity in the locality. It is an attempt to create a permanent Asset to ensure round the year Livelihood of 24 nos of household, which will reduce the dependency of said households only on MGNREGS.250 nos of Brick will be produced by single persondays. 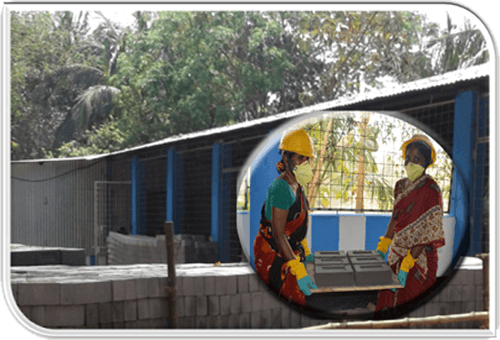 Benefit/Output of the Project: Self Employment of SHG Group. This project indicates a social and economical development of its related person and area.This project is going on to reach the goal of MGNREGS . 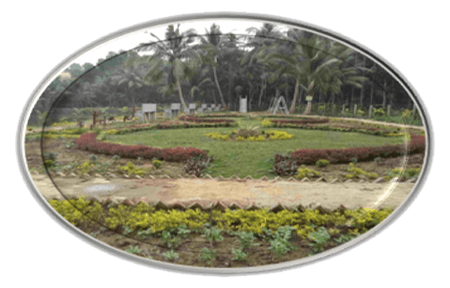 This Project is fully concentrated in residents, Shops, Temples, Govt. 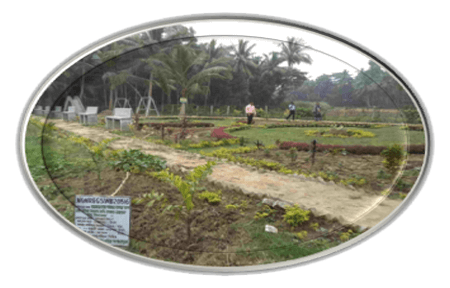 Buildings, and Vegetable markets in Itamogra-II Gram Panchayat, under Mahishadal Block, Purba Medinipur. So, first of all we have to do mass cleaning in whole Villages and create awareness about source segregation, type of organic & inorganic wastes, current Waste disposal system among the residents, shop keepers, Shop keepers in market and shops etc.To Make the source segregation more effective, we will request people to put in organic in Red bucked and Organic separate in Green bucked to be supplied by us. Garbage collection will be done twice a day (Morning : 8:00 am-10:00 am or 11:00 am to/Evening 3.00 pm -5.00 pm) from each and every resident/commercial shops (including Sunday and all holy days) through Try-Cycle by trained workers. Finally, the waste will be bought to the “Solid Resource Management Centre” for the secondary segregation and for the further processes to covert as incomes to self sustain the hole project. Every days the regular activities are Waste collection, Segregation Composting, area cleaning etc. Beneficiaries of the Project: Residents, Hotels, Market, Shops, Waste Generated Trade Zone, Govt. & Non Govt. 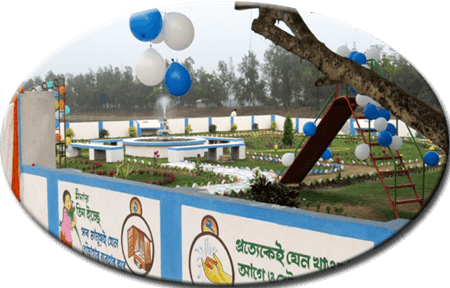 Institute & Offices of Garkamalpur Gram Panchayat. 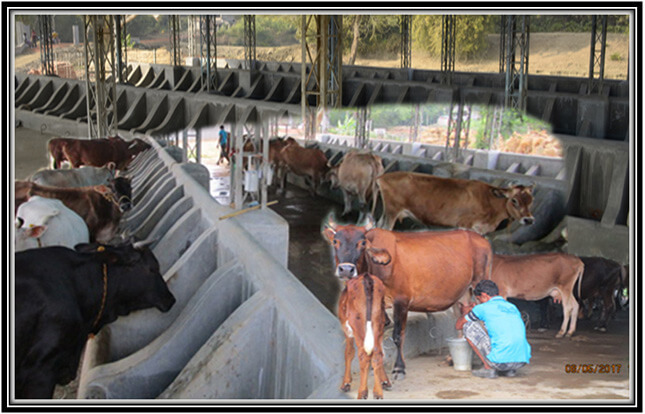 Ptashpur-II block has good potential for cow farming. Milk produced here is of high quality. Still good market for milk is not possible in such an interior locality. Keeping all this in view the block, through MGNREGA scheme has set up a large cow farm, where the different purchasing companies can come. The farmers now can sell milk directly to the farm at good price. This will surely change the socio- economic face of the poor families of this locality. Benefit/Output of the Project: : In the field of bio-gas generation under the scheme IIT, Kharagpur has also extended their help. 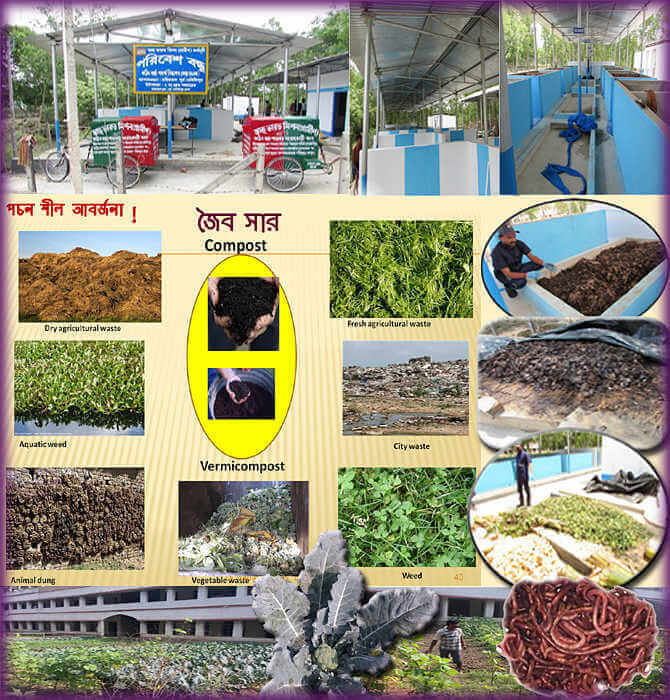 The produced bio-manure can be used in vegetable cultivation thereby. 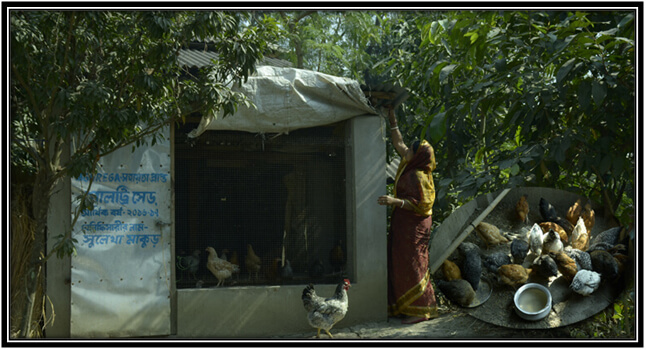 Already under MGNREGA convergence scheme for about 278 needy families arrangements were made for keeping chicken. After wards each family has supplied with 10 chicks on behalf of the Department of Animal Resource Development. Location: 278 nos. Schemes have been implemented in the different place of Argoal, Khar, Mathura, Panchet, Patashpur, Southkhanda and Srirampur GP under Patashpur –II Block, District – Purba medinipur (Programme Implementing Agency – Patashpur –II Panchayat Samity). Benefit/Output of the Project: : With the benefit of MGNREGA, Patashpur-II has entered into a new era of development. The theory of convergence makes MGNREGA more effective to minimize vulnerability of poor families. At everywhere in which administration is to intervene to relief common people, MGNREGA is the prime solution. A social disease of this backward block is child marriage. Enquiry reveals that here also the root cause is economic instability. Here again, MGNREGA following its concept of “Briksha Patta” in sprit has selected only those marginalized women consumers who have girl child between 13 years to 16 years for distributing 200 plants each. In condition- Their girl child must not get marriage before 18 years; There are more than 617 such consumers enjoying “Briksha Patta”, here is renamed by ‘Ma Lakshmi Scheme’ through Panchayat Samity. Location: 617 nos. schemes have been implemented in the different place of Argoal, Khar, Mathura, Panchet, Patashpur, Southkhanda and Srirampur GP under Patashpur –II Block, District – Purba medinipur (Programme Implementing Agency – Patashpur –II Panchayat Samity). 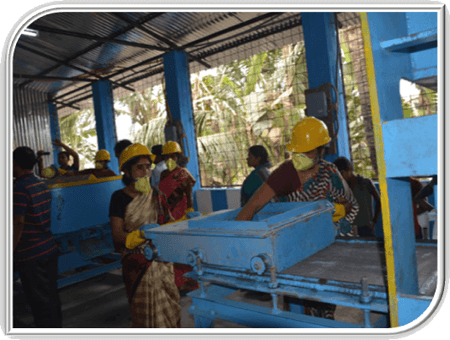 Benefit/Output of the Project: : Now their girl children will be no more a liability to them. “Briksha Patta” will ensure their economic stability. This will also afford them to bear the expenses of their daughter’s study. The block will develop into a green block. Side by side child marriage can be avoided. Also the rate of girl child drop outs will be reduced. In this way the MGNREGA schemes has helped women empowerment of this Block and avoid the child marriage like social disease. West Bengal has a substantially long coastline of almost 325 Km (including islands). The coastal belt of Medinipur District represents 27% of West Bengal Coastal track (60 Km.) extending along the west bank of hughly estuary from New Digha and then curving around Junput, Dadanpatrabar, Khejuri and Haldia on the east to the further North East upto Tamluk or even on the Bank of Rupnarayan. 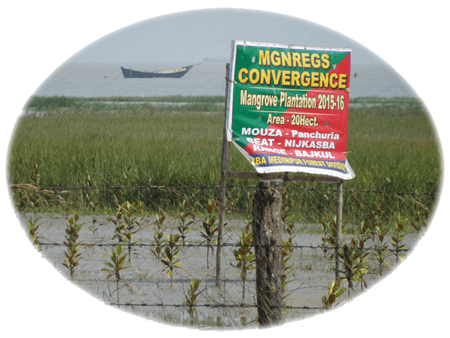 This lengthly coastline and favourable soil conditions encourage the line departments like “Forest” to build a Mangrove Shield along the coastline of Purba Medinipur District. Efforts have been made since 90’s by the Forest Department to raise Mangrove Plantations either from State Govt. fund or later as a Line Department of MGNREGS. Continuous efforts, patience have brought & Success. 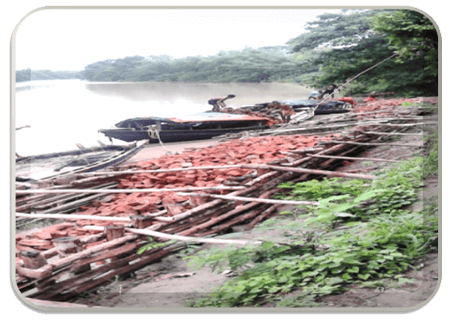 As a result Forest Department in Purba Medinipur has successfully raised Mangrove plantations in the areas like Khejuri, Nandigram, Junput & Haldia. Location: Mouza : Panchuria,J.L. No. : 105,Block : Khejuri – II,Total Area : 20 Hectors, No. of Seedlings planted : 1,00,000 nos. Benefit/Output of the Project: Though most of the Mangrove species are slow growing species so proper guideline & protection is needed to raise this kind of plantation.The first visible impact of this plantation was that the density of dhani grass increased with a rapid speed as a result the erosion of the that planting area increased. Gradually the height of the land started to increase, now that piece of land is higher than the surrounding lands. The Mangrove seedlings also have started to establish themselves gradually and are playing their part to prevent soil erosion. In near future this Mangrove is going to support a stunning diversity of life, both terrestrial and aquatic. 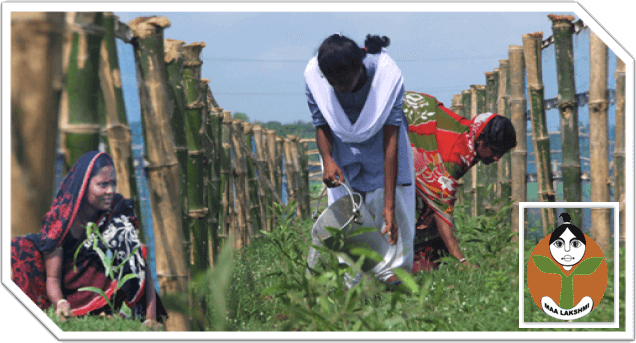 With a view to protect Rosulpur River Bank which is decaying gradually, Khejuri-II Development Block Started ‘Vetiver Plantation’ as ‘ PILOT PROJECT’ for the first time in the entire Purba Medinipur District with the help of District MGNREGS Cell, Tamluk, Purba Medinipur. Location: As a trial, Khejuri-II Development Block have already taken 2 schemes of ‘Vetiver Plantation’ At Gorahar Jalpai under Janka Gram Panchayat and the second one at Boga under Nijkasba Gram Panchayat, length of the scheme is 1km each. 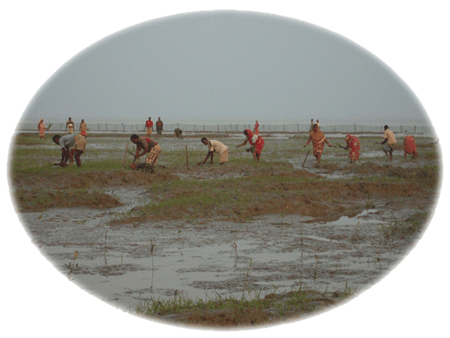 Benefit/Output of the Project: Vetiver grass is grown for many different purposes. The plant helps to stabilise soil and protects it against erosion, but it can also protect fields against pests and weeds. Vetiver has favourable qualities for animal feed. From the roots, oil is extracted and used for cosmetics, aromatherapy, herbal skincare and ayurvedic soap. Due to its fibrous properties, the plant can also be used for handicrafts, ropes and more. Naichanpur-II Gram Panchayat under Moyna Dev. Block at Purba Medinipur situated beside of Kansaboti river. The river has been seen dangerous position at rainy reason and its breaking bundh in weakened point where river water entered in resident land and makes flood and spoiled many cultivated land, fisheries and also life of people. So Gram Panchayat Decided that to prevent flood at first weakened point of bundh are to be strength with pilling. They taking this scheme under MGNREGS in 2015-16 Annual Action Plan and completed this work before monsoon season. 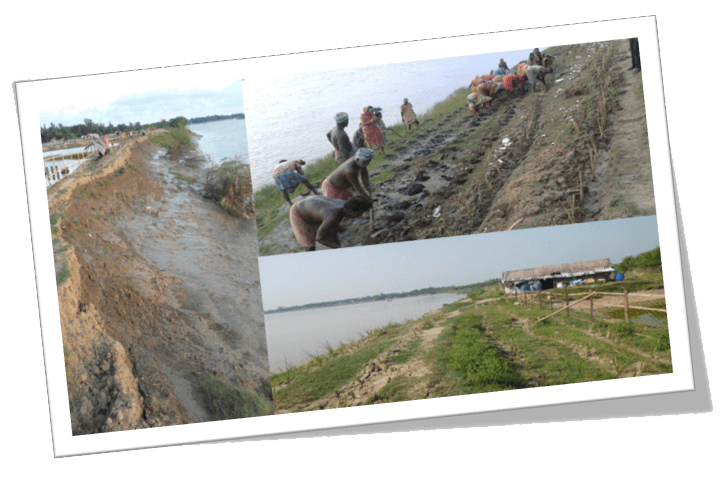 Benefit/Output of the Project: Now they protect flood this mansoon season and save cultivation, fisheries and life of people. 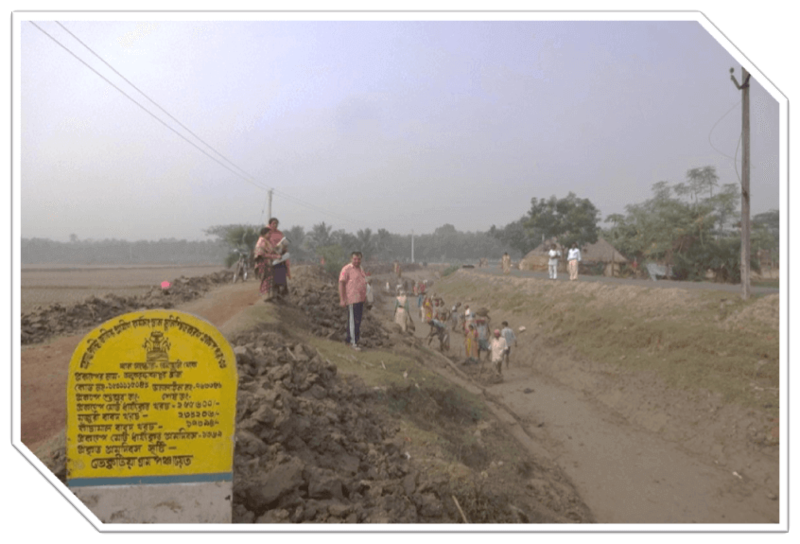 Gopalchak Cannel situated within Bhekutia Gram Panchayat area under Nandigram-1 Dev. Block. The Cannel begins from Tajpur Stand and meets into Haldi river through Manuchak Mouza. The cannel is the main water source for the cultivation lands by the two sides of the canal for agricultural activities. For the last few years the cultivation lands had been deprived of water due to lack of water carrying capacity of that canal. In the other hand, flood in the said Gram Panchayat areas may be real threat in near future for the citizens. That is why, an initiative of MGNREGS, Bhekutia Gram Panchayat was the remedy to solve the problems. The whole cannel is re-excavated within nine parts i.e. nine Nos Schemes. 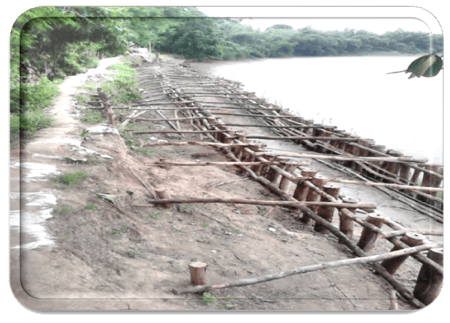 With the help of MGNREGS, 4.34 km cannel has been re-excavated generating 14101 person days in two consecutive financial years i.e, 2015-16 & 2016-17. Benefit/Output of the Project: The cannel is now carrying water with a greater capacity and it has been helping in agriculture of about 100 acre agricultural land at Bhekutia Gram Panchayat. Presently the Gopalchak Cannel is not only promoting yielding capacity but it also generated a lot of persondays for the two financial years that is why many poor households have been able to ends meet working on the work site. Besides these the socio-economic condition of the Bhekutia Gram Panchayat has been developed with a greater extend.